Okay, now that you've tried the Chocolate Pudding Pie, let's try another one of my Mom's desserts. Not only did she crush the graham crackers for the crust but she actually cooked her own apples. The woman had the patience of a saint. Me..... I try to take a shortcut whenever I can. Prepare 1 pkg vanilla pudding (cooked variety) following the directions on the box. Carefully spread 1 can of apple pie filling over the chilled pudding. 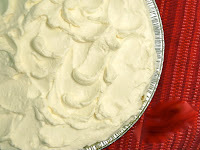 Whip 1/2 pint of heavy cream, adding 2 tbs powdered sugar and 1/2 tsp vanilla until fluffy. ** If using canned whipped cream, top with cream just prior to serving.